Not a lot of people know exactly what their future family will look like when they’re still single…or even within the first few years of marriage. But Luke and I always knew we wanted a large family and we’re pretty tickled pink that we’ve been able to make this dream happen! Of course, having almost 8 children isn’t your typical success dream, like owning your own home or traveling the world. It’s not filled with beautifully decorated rooms or fancy European food…and the hours are atrocious. But it really IS wonderful! Here’s just a peek into the good, the bad and the ridiculous of parenting a sports-team-sized crew! • There’s always something going on. This is one of the things that made the biggest impression on me when I was a kid and would visit my aunt and uncle who had 9 kids. There was this awesome sort of chaos where something interesting was always happening. As a mother of 7 smallish children, I now realize that this translates to an insane amount of mess-making ALL. DAY. LONG. But I still love it. • The kids always entertain themselves and each other. I love the little friendships I see blossoming among my kids. I mean, the fights are there too, but every one of my children has someone who they love to play with daily and I think it’s fantastic that, as adults, they’ll have built in friends for life! • All my kids are getting hands on parenting training every single day. And not only that, but also lessons in anger management, conflict resolution, patience and forgiveness. Did I mention that I’m getting these lessons on an hourly basis as well? But I guess that goes for parenting in general, no matter how many kids you have. We just get it on an enlarged scale. • Children of big families learn independence and they learn it early on. At our house, this is just a natural consequence of mom being outnumbered 7 to 1. It’s a physical impossibility for me to get every child a snack, drink of water and help them to the potty every time they need it. So, big siblings fill in the gaps and younger children learn to do things themselves. Most of the time, this is a really great thing! • Kids learn responsibility and that the world doesn’t revolve around them. 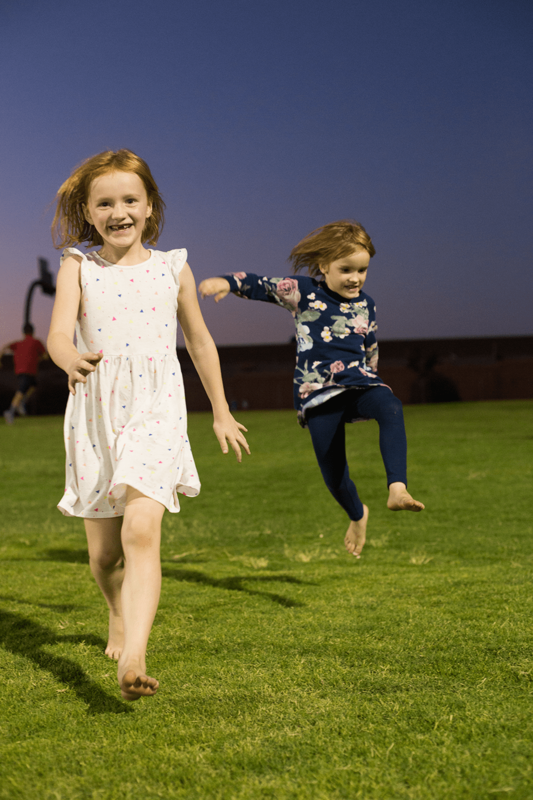 I have to make a conscious effort to have regular one-on-one time with each of my kids, and so because there are limits on mom and dad’s time, budget and attention, I think our kids are learning to be team players. I’m hoping this means they’ll be more prepared to take on their own adult responsibilities when they leave home, like cooking for themselves, managing money and being selfless in relationships. Bonus if cooking for themselves involves something other than Hamburger Helper. • We’ve had to learn to live with messes. I’m not a complete neat freak, and it turns out that my ability to tolerate messes has been my number one most useful trait as a mother! I’m not saying that our house is filthy or that we allow unhealthy living conditions, but there’s always some sort of stuff somewhere: kids’ papers, toys, clothes, etc. I clean up one room only to have children destroy another while I’m occupied. I stay sane by allowing some TV time most days so that things stay clean for at least an hour and by realizing that this stage won’t last forever! • I’ve had to give up the illusion of perfection. Especially in today’s age of perfectly curated social media posts, most moms have realized that real life looks a whole lot different than what most people choose to share. And that’s OK! I would need a literal army of assistants to make sure me, my kids and home always looked picture perfect (or even decent enough to venture out in public!) and that’s not something that’s a priority to me. As a disclaimer, however, I have to add that as a blogger I work really hard to make sure my images are pretty to look at…but don’t think for one second that those images come without blood, sweat and tears! • Moms of big families have to get really picky about which battles to fight. I have one child in particular who is THE most stubborn child I have ever encountered…I let her do SO many things that I never thought I’d ever allow a child to do, simply because she is EXHAUSTING! And I realize that applying 47 coats of bright red lipstick to her face is a lot less destructive than some of the other things she could be doing. In the end, this has given me patience, new priorities and an enhanced sense of humor. • We’re constantly streamlining our top priorities as parents of a big clan. I have a friend who literally always has a perfectly clean home and perfectly dressed and coiffed children. I used to be really bothered by the fact that in comparison, our family looked like the Beverly Hillbillies. But then I realized that my priorities are just different. Because my time is short, I have to allow some children to dress and groom themselves (resulting in some creative and Punky Brewster-esque fashion choices), and I choose to write this blog and be creative over keeping an immaculate home. Big families can teach you to be a ridiculously efficient time manager, if we let them! • We’ve slowly come to the realization that we have to do things very differently from other families. Our vacations, dinners out (ha! ), shopping trips and holidays all look much differently now than they did when we had 3 kids. Some of that makes me sad…I’ll probably never be able to afford (or handle the chaos of) flying my entire family to Disneyworld, but part of that is also very exciting. We learn to sleep in close quarters with each other, to get creative with the budget and to find new solutions to problems. Our home will likely never be featured in a magazine (my walls are more scarred than a WWII battlefield) but there’s always some sort of fun going on! There really is so much joy, exhaustion, frustration, excitement and thrill in running a family, regardless of its size. In the end, family has to be the top priority in life or we run the risk of treating our most cherished loved ones as burdens. The thing is, when family becomes the most important, then all those sacrifices simply become stepping stones to this magnificent future that’s waiting for us and our children! As the oldest of 8 I can relate to most of this. Vacations were always different than my friends families that only had a few kids. Expectations were always different as well. We would have to pitch in and help out. But the memories of the vacations and things we did as a family do stick with you. I will say I think my youngest sibling is so spoiled, but there is 20 years between her and me, so she is pretty spoiled. And I can say that our family would not be complete if we didn’t have each of us in it. Ha! I think every family thinks the youngest is spoiled…and they’re probably right! There really are pros and cons to every family size. Thanks Kristie! I love this post Bonnie!! And the pictures are delightful!